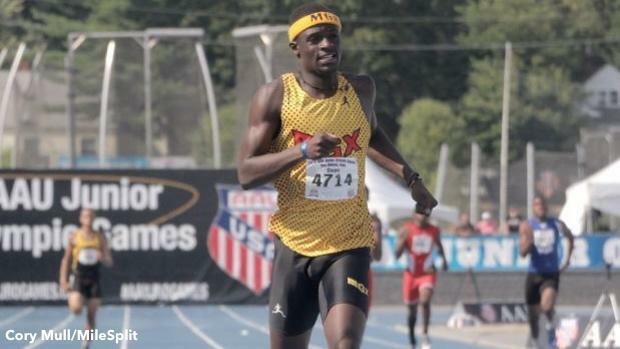 That's all it took for Tyrese Cooper to go from being a regular kid starting his first year in summer track to being one of the fastest and most recognizable names to ever compete in AAU track and field. This was the Cooper of Miami Gardens Xpresss that we all grew with. He set countless records and often walked off the track into a sea of kids, parents and coaches waiting to take pictures and sign autographs. But looking back, on the eve of his final races at the AAU Junior Olympics on Saturday, he points to where it all began. "I didn't really care for track at first," Cooper said. "It wasn't till I was losing--and I was like I found something I can be good at, why am I losing? I was good at football, I was always great at football because I just had that talent. Everyone from Liberty City focuses on football and for me to be the first person to make it out of Liberty City as a track star feels great." On Saturday, Cooper will attempt to pull off a triple crown, vying for wins in the 100m, 200m, and 400m. But with reality setting in, he's taken some time to reflect on what he'll miss most about youth competition. "It's going to be really sad because I'm going to miss the workouts, my track team and everyone else since I'll be going on to college and maybe even go pro," he said. "I Iove AAU, it's like a family thing, they're like a family to me. I love all the staff that work here. I'm ready to go, but I'm not ready to go. This is where I started off, this is where it all began and now I'm going to the next level." With the college recruiting process already started for Cooper, he's taken the time to think about his next steps. He says his plan is to graduate this December at Miami Norland (FL) High School and then enroll early at the college of his choice. "I'm ready to race against some Michael Normans and people like that," he said. "There're always people in college coming out and running really fast times. I feel like I'm ready for it. I believe as soon as I get in college I'm going to drop a crazy time because the way I train is unbelievable. Losing puts a stress on me and it only pushes me to train like there's no tomorrow." Cooper revealed his top five schools are the University of Georgia, Southern California, Texas A&M, Texas and Oregon. However, he said that list might change once he takes his visits in the fall. Darius Lawshea, the head coach of Miami Garden Xpress, said he's excited to see his athlete move on to the next level, though he personally thinks Cooper should wait to graduate in the spring. Ultimately, he'll support Cooper's final choice when the time comes. "Everything is bittersweet. We had our ups, we had our downs, but we had more ups," Lawshea said. "It's almost like it's sad, yet joyful because it's like your kid leaving the house. It's time to grow up and it's time to make adult decisions. Now he needs to move to that next life. I've been there since 13, and I want him to learn different people and to be well rounded." In his first summer with MGX, Cooper began his career in the 400m, 200m and 100m, hitting times of 54.19, 24.15 and 11.95. Not two years later, he won the FLYRA Middle School State Championship in all three events with a 47.92, 21.26 and 10.61. The nickname 'Smoke' followed. "He trained and trained and at 14, he started to recognize that if he worked hard true gifts will come," Lawshea said. "He has a gift, but his gift just doesn't come without work and he's starting to realize that now through trial and error and going back and forth. He knows his true gift comes when he works hard. When he turned 15 his whole life changed, his potential skyrocketed and it hit social media and blew up." When social media saw Cooper's performances, he became on overnight sensation in the track and field community. It didn't hurt that he only lost a handful of races. 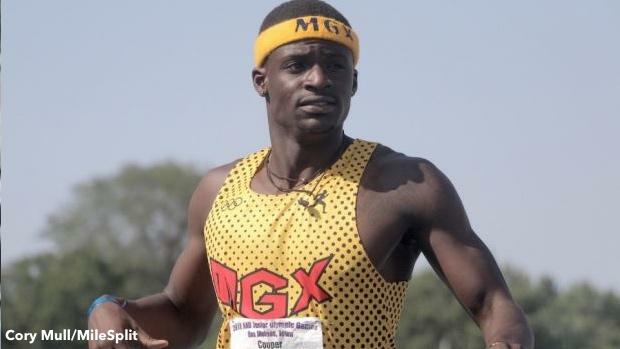 Cooper was arguably the first social media star at the AAU Junior Olympics, opening a whole new market for names like Brandon Miller, Athing Mu, and even his teammate, Cha'iel Johnson, who has over 19,000 Instagram followers. Johnson and Mekhi Gammons seem to the next big super stars from MGX and both have said that Cooper is like a big brother to them. At this stage, Cooper feels like he's passing the torch. "I'm going to miss them," Cooper said. "They're going to be great. They're doing this at such a young age, and it took me a long time to be where I'm at now. I'm ready to see what they can do with their talent in the future," Cooper said. Cooper had a tough year this season, with two high-profile arrests in Miami broadcast to the public--though all those charges were eventually dropped. And with the whole world watching via Twitter and Instagram, it made it harder to deal with those mistakes. But he said he tries not to dwell in those dark moments. He enjoys being an idol to the younger athletes. "Everyone's waiting to see the time I hit next, even the little kids," he said. "It got so crazy that I had to get a body guard. But, I like that to the kids I'm the runner they can touch, unlike Usain Bolt and all the other super stars. To them I am a superstar and they can take pictures with me and talk to me and see me run." In his high school career, Cooper has gone sub-46 nine times, with big wins at The Great Southwest Class, The Armory Invitational, New Balance Indoor and Outdoor Nationals, a second-place in the 200m at the Pan American Junior Athletics Championship and nine individual AAU Club Championship titles and six AAU Junior Olympic titles. No matter the outcome of his final races, Cooper has done one thing. He's had a Hall-of-Fame career in AAU track and field.